Сosmonaut Alexei Leonov reported that the truth about the death of the first Soviet cosmonaut Yuri Gagarin had been declassified. The film “Yuri Gagarin: First in Space” has been released. Its premiere coincided with the emergence of new accounts of why he died. 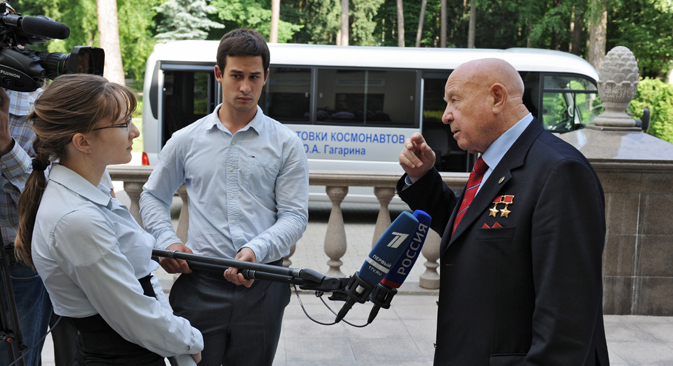 On the eve of the film’s release, cosmonaut Alexei Leonov said that the truth about the death of the first Soviet cosmonaut had been declassified. On the eve of the film’s release, Alexei Leonov reported that he had managed to obtain previously secret documents that showed the cause of the first cosmonaut’s death to be different from what had been officially announced. The official findings said that Gagarin’s plane had performed an abrupt manoeuver, gone into a spin and crashed into the ground; but Leonov claims that another plane was involved in the disaster. According to the version that Leonov communicated to journalists as the only correct one, the cause of the disaster was the fact that, during the flight by Seryogin and Gagarin, another plane appeared in their air space without permission. Flying on afterburners in the clouds, it passed within 33–50 feet of Gagarin’s plane, causing it to flip. The plane was at low altitude, and Gagarin and Seryogin were unable to correct it. The truth about Gagarin’s death, which has allegedly been declassified by the government, is just one version. It is not the most fantastic one, of course – there are also stories about aliens interfering with the flight – but neither is it the most plausible. Yuri Karash, corresponding member of the Tsiolkovsky Russian Academy of Cosmonautics says: “This is a theory that was put forward about 20 years ago by Leonov and Belotserkovsky, an aerodynamics expert. Mikoyan believed it was most likely to have been a collision with a probe. Someone thought a battery had exploded on board. Someone thought they had experienced a sudden loss of consciousness. Seryogin lost consciousness, the controls got jammed – God only knows. The makers of this film about the first cosmonaut are especially proud of the fact that their picture was the first to receive the approval of Yuri Gagarin’s relatives. It is also quite important that the cosmonaut Alexei Leonov was a consultant to the film. Observers do not rule out the possibility that it was no accident that the new versions of Gagarin’s death coincided with the release of the film. Alexander Golubchikov, editor-in-chief of the Internet magazine Real Cinema, says this: “These events are probably connected. It’s possible that the film’s producers have somehow made a connection. When he reported that he had obtained previously secret documents, Leonov did not go into detail or disclose them completely. For example, he said that he is keeping secret the name of the pilot who was in the second plane. This man would now be more than 80 years old. First published in Russia in BFM.ru.